I finished up the garden path sampler for the &Stitches June sampler-along! Once I ripped out the excruciatingly bad backstitch trellis and went with something else, everything started going pretty quickly. I’m pretty happy with how it turned out. The section I like the least is the wave filling stitch. It’s another one like the erstwhile backstitch trellis section that I think I’d do a better job of on evenweave fabric. But it was nowhere near as crooked as the backstitch trellis, so I decided to leave it be. 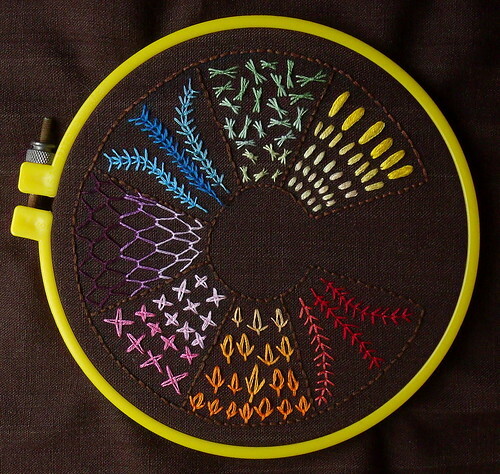 I’ve already started another sampler using this template but in the 6″ size (this one is 5″) as my next TAST sampler.